When signing up for emails from a book promotion service, I was faced with a column of check boxes asking me what I like to read. Science fiction? Yes. Fantasy? Yes. Dystopian? Hell, yes. Historical biography? Sure. Women’s fiction? Women’s fiction. What did it mean, really? But I like women, and fiction, and especially fiction about women, so I checked the box. When I started getting examples of categorical ‘Women’s fiction’ in my emails, I noticed something: The covers were covered in men and children. Even here, women were largely defined by their social usefulness, their relationships, whether romantic or familial. The most common words I saw in the titles and blurbs included ‘saved,’ ‘his,’ ‘us,’ ‘baby,’ ‘child,’ and, in a quirk of romance culture, ‘cowboy.’ The word ‘me’ also appeared often, but only in the context of instruction: Seduce Me, Take Me Away, Leave Me Here to Pine for Your Rippling Chest Muscles. Needless to say, I had been hoping for a bit more variety. I unsubscribed from women’s fiction. 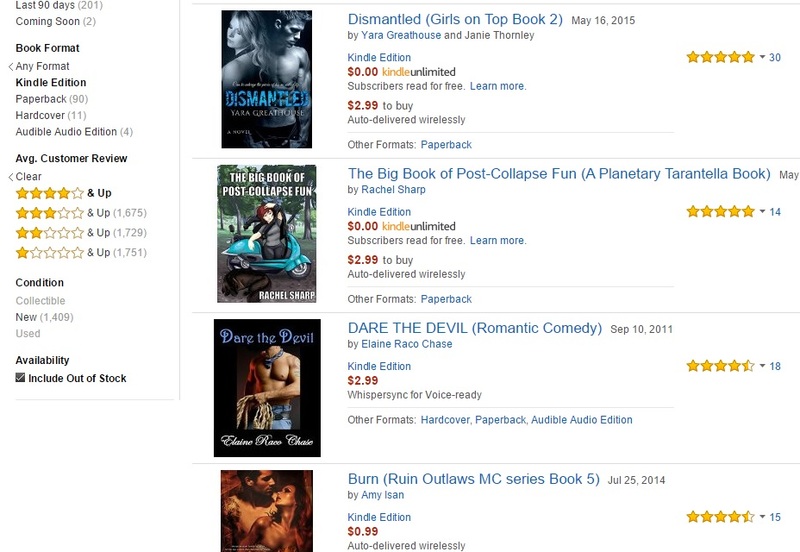 However, the universe being the hilarious trickster-beast that it is, my own book ended up in the Amazon category “Women’s Action & Adventure.” This gave me another glance at the fiction designated to my gender. I was absurdly out of place. My novel, The Big Book of Post-Collapse Fun, is the story of a woman trying to survive a geological apocalypse with only the company of a big silly dog. If she is defined by a relationship, it is that of herself to the planet Earth. She tries and fails and learns, runs from a volcano, treks across the tundra, and gets into a gun fight with bandits. Why? It sounds like a woman having action and adventure to me. Don’t get me wrong. Relationship stories are important, and many absolutely astounding novels about women and their parents, siblings, children, lovers, or mentors are out there. My question is, why is women’s fiction so often defined primarily by women’s relationships? Where is my “Women’s Action and Adventure” story about a lady space pirate, the story that focuses on her heist instead of her husband? (If you wrote that, let me know, I will promote the hell out of it.) Why do we call it women’s fiction when it’s largely about everyone but the woman? We are also not socially limited to our category when it comes to books, which is a big deal. I have never walked into a bookstore and had a clerk say to me, “Oh, no, you don’t want that Scott Lynch, let me show you to the ladies section.” We are free to read what we like. I just want to know why our gender label gets assigned to such a narrow band of the big beautiful world of stories. Why do we even need women’s fiction, unless everything else is for men? Or is this like that Bic Pen for Her thing, where once upon a time, someone in marketing decided to try and squeeze a few extra bucks out of people socially conditioned to scream their gender conformity (politely) from the rooftops? As sexist nonsense goes, the definition of ‘women’s’ genres is really only a small drop, but since living with sexist nonsense is often a bit like water torture, I think the drip is worth asking questions about. I know this is an old post, but it showed up as a suggested link at the bottom of one of your recent posts and I just had to click. From what I’ve learned about women’s fiction, it’s defined as stories about “a woman’s journey,” the female experience in our world. It sounds like that promotional company was sending you romances, not women’s fiction? WF can include relationships, but they’re not straight-up romance novels about Bulging Biceps of Biceppy Glory, haha. That’s not what I’ve understood them as anyway. As for why female-centered adventure books aren’t considered WF, I think that’s because the dominating factor in those stories is the adventure. Just like with crime novels starring a female detective, the main factor is the crime. Etc etc. It’s not really about “fiction for women,” it’s more about “what’s the central focus topic here?” But yeah, it’s a weird genre to try to define!